An ultra-high performance, multi-surface airbrush paint suitable for any substrate from fabric to automotive applications. 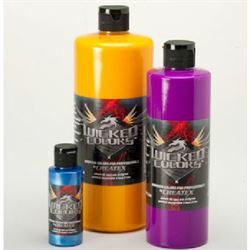 Ideal for t-shirts, automotive graphics, illustration and more, it is an extremely durable paint that withstands direct, prolonged exposure to outdoor elements without washing or fading. Made with a highly durable binder, the paints cure to a strong film with air-drying alone. Heat may be used to further assist curing and is recommended for t-shirts and fabrics intended for use with multiple washings. Heat is not required for automotive, illustration and most other applications. Wicked Deep Blue 2 oz. Wicked Pthalo Green 2 oz.